Ground floor cafe with basement. Corner profile. High volume of vehicular and pedestrian footfall. 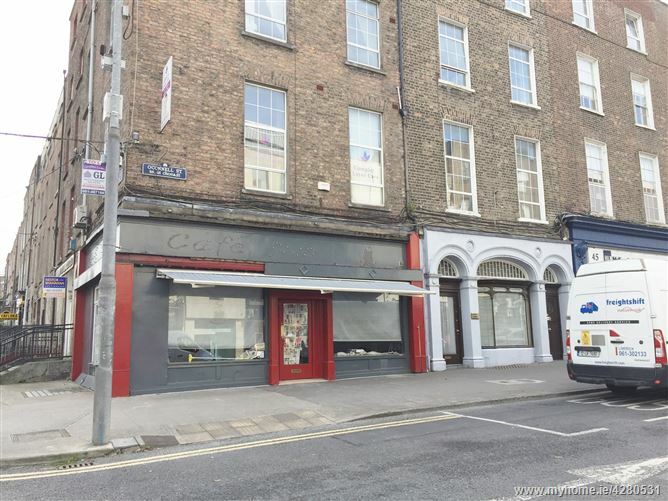 Large open plan dining/ serving area on the ground floor with three large display windows and a pedestrian door leading onto O’Connell Street. The basement can be accessed from a staircase at the ground floor and consists of a Dry goods store, Sluice room; Ladies & Gents toilets; Kitchen; Staff room and large store rooms.Rates approx. €4,125 per annum. Located in Limerick’s Central Business District at the junction of O’Connell Street and Cecil Street, neighbouring occupiers include AIB; Ulster Bank; KBC Bank; McKeogh Gallagher Ryan Accountants; AXA Insurance; Limerick Chamber of Commerce and Gardens International.